In month of January 2017 competency and motivational training was organized at BDVS administrative office. It was 15 days of training which was conducted from 16th to 30th January 2017. The total number of participants was 38. They were school children from 5th to 9th standard. 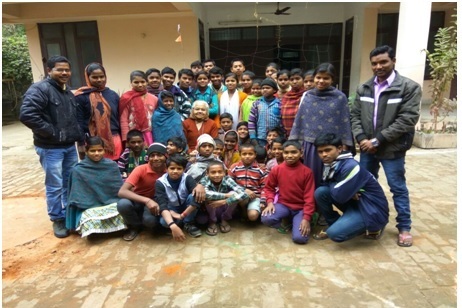 All the children were from different villages of Khagaria district. Most of the children who had come for this training were selected from previous two batches that had performed better in English, Math, Reasoning and co-curricular activities. However six of them were new to this training. To make competent in Math, English and Reasoning. Motivate children to excel in academics. To teach moral, values and ethics of life to become good students. Develop leadership quality in the children. To enhance hidden talents through co-curricular such as drawing, painting, singing, speech and waste material management. This training was comparatively better than two previous trainings. Children were able to understand fast and were interested to learn new things. There were four full time teachers appointed for the training. The classes would begin in the morning with yoga and English, Math and reasoning were taught throughout the day . Some of the children had come for the first time and had not attended the previous two trainings, so they were weaker than the others in all the subjects, therefore teachers had to go back to the basics and explain the concepts. This was also one of the reasons we could not move fast. However, this batch could gain more advantages both academically as well as in extracurricular activities.